Apple’s confirmed the first major update to iOS 12 and the iOS 12.1 update is currently in beta testing ahead of an unknown release date later this year. The iOS 12 update is just a day removed from its official release, but Apple’s already confirmed a brand new version. It’s not the iOS 12.0.1 bug fix update some users are hoping for, but the iOS 12.1 update will be larger your standard iOS release. iOS 12.1 will serve as the first milestone upgrade for iOS 12 users. Milestone upgrades always come with more than just bug fix and security patches and the iOS 12.1 update should deliver a new set of features for all devices capable of running iOS 12. In this guide to iOS 12.1 we’ll take you through the most important things to know about the update in September. Our walkthrough includes a quick look at iOS 12.1’s known changes, the iOS 12.1 release date and release time, the iOS 12.1 beta, and what you can expect from Apple. If you can’t wait for the iOS 12.1 release date you can try iOS 12.1 on your iPhone, iPad, or iPod touch right now. Apple’s iOS 12.1 beta is now available for those in Apple’s Developer program. It’s not available via Apple’s public Beta Software Program just yet, but we expect that to change in the near future as Apple ramps up testing. The iOS 12.1 beta is compatible with all devices capable of running iOS 12. The list includes the iPhone 5s, iPad Air, iPhone X, and so on. Before you jump into the iOS 12.1 beta note that the software is likely plagued with numerous bugs and performance issues. These issues could wreak havoc on your apps, your device’s battery life, and your day-to-day use. While some issues can be fixed manually, others will require a fix from Apple. Don’t expect the iOS 12.1 update to land in September. It’ll likely be a few weeks before Apple pushes the software to iOS 12-powered devices. Apple hasn’t confirmed an official iOS 12.1 release date or a release window so there’s no telling how long the update will stay in beta testing. Milestone upgrades like this typically stay in beta for several weeks before they roll out to devices around the world. Apple’s promised new emoji characters and Group FaceTime calls before the end of the year, but it’s unclear if iOS 12.1 will be the update that delivers these features. Group FaceTime was originally supposed to launch with iOS 12, but Apple delayed it. It could be delayed again if testing doesn’t go well this time around. Apple is also reportedly planning to launch new iPad Pros this fall so it’s possible the iOS 12.1 update ties in with the launch. The company hasn’t confirmed a launch date for the new iPads, but many believe it could take place in October, possibly alongside the iPhone Xr launch. iPhone Xr pre-orders kick-off on October 19th ahead of a release date on October 26th. Developers digging through the iOS 12.1 beta have discovered code that references landscape Face ID support for new iPad Pro models so don’t be surprised if this update accompanies the new devices to shelves. We don’t have an iOS 12.1 release date yet, but we do know exactly what to expect from the iOS 12.1 release time. The iOS 12.1 update will likely arrive around 10AM Pacific whenever Apple decides to release it. 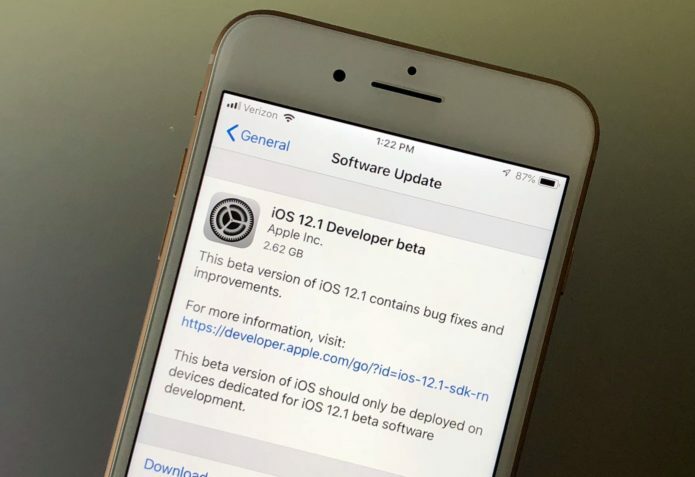 Apple will also release iOS 12.1 beta updates for developers and those in the Beta Software Program in and around 10AM Pacific. The company usually releases new beta updates every 1-2 weeks though releases typically come quicker once the update’s release date gets close. Group FaceTime is alive once again inside iOS 12.1. Apple’s currently working on a handful of other features including dual SIM support and a new ECG app for the new Apple Watch 4. The company is also working on releasing new emoji characters for the iOS keyboard including a kangaroo, a peacock, a parrot, a lobster, and new food emojis including a mango, lettuce, cupcake, moon cake, and many more. We’re still digging through the iOS 12.1 beta and we’ll let you know what we find. Jailbreak developers haven’t released anything for iOS 12 or any of Apple’s newer iOS 11 updates. The only way you can jailbreak a device is if it’s running an older version of iOS 11. Unfortunately, there’s no way to downgrade to anything older than iOS 11.4.1. Jailbreak developers typically don’t burn exploits on early pre-release software so current and prospective jailbreak users should avoid the 12.1 beta. While not confirmed, we expect Apple to release at least one iOS 12 bug fix update (likely iOS 12.o.1) before the iOS 12.1 update arrives. Last year iOS 11.0.1 arrived just a few days after iOS 12 so those of you dealing with iOS 12 problems should lookout for new software this week and next.